This historical/contemporary romance novel debuted in September 2015 as the first in the Washington's Woods series. "Where Two Rivers Meet" is a labor of love produced from my own personal genealogical research. A forbidden historical romance leaves secrets for generations to come. When Nicole Durham discovers her true heritage from the symbols on a star sampler, conflict arises surrounding an 18th-century farmstead located in Ravenswood, West Virginia. Her budding romance with Johnny Beck complicates her life further when his father, Judge Beck, leader of the KKK, learns about his son's involvement with a biracial girl. In the meantime, the sins of past generations catch up to her when she learns her true identity, and what she must do to secure her a legacy for generations to come. All this leads Nicole to renew her faith in God and mend her relationship with her father. Although plans for a series were underway, Tate Publishing is no longer in existence which left the contracted series homeless. Plans are still underway to obtain a new publishing home soon. Stay tuned to this website for updates. In the meantime, you may contact the author to order a First Edition signed copy for only $15.00 today at londahayden@gmail.com. This price includes tax and shipping. "Candy Moon" and "Candy Moon Choo Choo" is a Children's Book series. Go along with the Thompson family as they deliver food to a needy family and discover ,along with Kevin, the true meaning of Christmas. Then ride along with the Thompson family again on a Christmas Train Excursion in Candy Moon Choo Choo, where Kevin meets a homeless veteran named Joe who leaves him a parting gift. 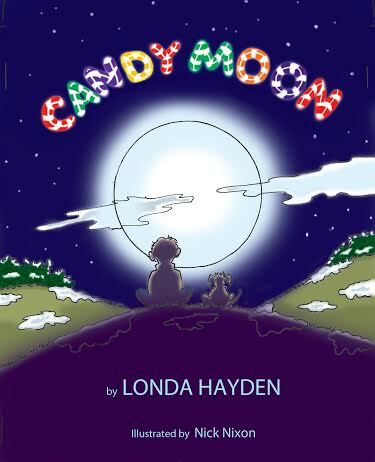 "Candy Moon" is available on Amazon.com and at http://lighthousechristianpublishing.com.